Michael has been shot and is lying on the floor. Debbie has crouched down beside him. Rick sprints across the forecourt and looks at Michael. Both Darren and the petrol attendant are standing in shocked silence. Suddenly, Darren makes a run for it and pushes past Rick. Rick tells the petrol attendant to get an ambulance and to call the cops. Darren runs across the forecourt, but narrowly misses being hit by a car as he runs between some petrol pumps. The car screeches to a standstill and Rick catches up with Darren, pinning him onto the bonnet of the car. In the muddle, Darren drops the knife on the floor. RICK: Just give it up, Stark! Give it up! Lou's attitude has shifted slightly since the marriage proposal and he makes his excuses to leave, saying that he has business paperwork to do. Cheryl tells him that with her money, he'll never have to work again. Cheryl mistakenly thinks that Lou has accepted her proposal, and Lou has to correct her. He says that he needs more time and Cheryl agrees to that, but says that whichever way he looks at it, he'll see it's the best thing for both of them! Connor has arrived. Lauren tells him that she's not made up her mind whether or not she's going yet. Connor tells her that the flight leaves at 10pm! She wants Connor to postpone going, but he says that he's already had calls from Hong Kong - if he doesn't get on the flight, they'll find another jockey. Lauren wants to talk to Brad, but since his disappearing trick off the ship, she can't get hold of him. Connor gets impatient and gives her a plane ticket. Lauren accuses him of coming on strongly, but he tells her that he rides to win! He tells her to get to the airport by 8 - he'll pick her up. LAUREN: What if I decide not to go? CONNOR: No chance. You love me, don't you? He kisses her and walks off. Lauren looks unsure. The police have turned up. The petrol attendant is telling his version of events - that Darren pulled a knife on him and then Michael burst in. He insists that he thought they were in it together. The policeman tells him that he'll take his statement at the station, but warns that he will be charged with firearms offences. PETROL ATTENDANT: He had a knife, damn it! I didn't mean to shoot anyone. Darren is in handcuffs. He interjects. DARREN: Why don't you blame the caped crusader here for sticking his nose into other people's business. The policeman tells him to shut up and Rick has got his arm around Debbie. She's distressed and wants to go with Michael. They turn, and Michael is being stretchered out of the petrol station by two paramedics. The policeman says that they need a statement off her, but she's extremely upset. Rick tells her that Michael's in good hands. Behind them, Darren is taken to the police car and on seeing him, Debbie runs across, trying to grab him. Rick pulls her away. DEBBIE: It's all your fault! I hate you! DARREN: Oh, that really cuts me up, Deb(!) Oh, by the way, Deb - you're dropped. DARREN: I only used you to get back at Michael. Looks like it worked, eh? Darren laughs. 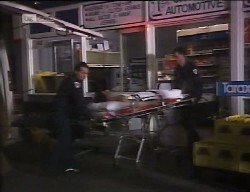 Debbie cries in Rick's arms and the ambulance with Michael in speeds away. Lauren is still fretting over the decision with Connor - she doesn't think she can just go off to Hong Kong without thinking things through. Lou tells her to listen to her heart. He points out that if Lauren still loved Brad, Connor would've got a brush off from the start. Lauren says it doesn't seem fair to go without saying goodbye. Lou tells her that life isn't always fair, and says that he doesn't want her to leave - but he does want to see her happy. Lou tells her that they're similar - he can't make decisions either. He tells her about Cheryl's proposal. Lauren is surprised because she knows Lou doesn't love Cheryl. Lou says that he's fond of her, and Cheryl likes him. He thinks that at his age, opportunities don't always come along like this. Lauren repeats his advice back - to listen to his heart! They laugh and hug. Julie and Phil are talking. 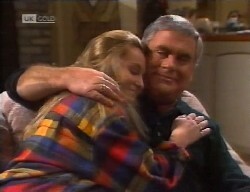 Phil tells Julie that he's quit his job at Lassiter's and he's moving to Perth. Julie is stunned. He says he needs a clean start and he's chosen Perth so he can put some distance between the pair of them (er, over 2000 miles is a bit extreme, Phil!). JULIE: I must've hurt you pretty badly. PHIL: (interrupting, loudly) I was about to say, I think it better she stay with you. PHIL: Provided I can have her for school holidays. Julie agrees to this. Phil tells her that he thinks the solicitors should thrash out the maintenance issue and although he'll use some of the money in their joint account for his airfare and initial set up costs in Perth, the rest of the cash is Julie's to keep her stable whilst the divorce goes through. Julie tells him that it's very generous of him and goes to touch him on his arm, but he backs away quickly. It looks as if Julie might be having second thoughts, but Phil's clearly very hurt. He goes to arrange his suitcases. JULIE: ...Hannah's going to miss you. PHIL: Yeah. I'm going to miss her too, but I think it's for the best. The phone rings. Julie answers the phone, not too happy at being interrupted. Phil picks up his suitcases to go, but Julie tells him to wait - the phone call concerns him. Phil puts his stuff down and approaches Julie. JULIE: Darling, it's Michael. He's at the hospital. JULIE: He's been shot. And it's serious. Lauren is writing a letter. A knock comes at the door and it's Cheryl - who has been crying. Lauren calls for Lou, who's in the shower. There's an uncomfortable silence. LAUREN: You don't believe in letting the grass grow, do you? LAUREN: You're like a big snake. You've got your coils around my father and you think all you have to do is hang in there until he stops struggling. Lauren thinks that Cheryl isn't going to give Lou enough space and time to work out if he wants to marry Cheryl or not. Cheryl says nothing. Lou appears and Cheryl tearfully approaches him. CHERYL: The police have rung and Darren's in jail. He held up a petrol station! LOU: Woah, calm down, calm down. I will drive you down the police station and we will see what we can do. Lauren covers her face with her hands, realising her mistake. Lou kisses Lauren goodbye and tells her not to leave the country without letting him know. Lauren promises not to. LAUREN: Cheryl, I am so sorry about Darren. Cheryl doesn't say anything. She and Lou leave. Lauren sighs and reads over her letter. LAUREN: Dear Brad. I'm going to ask your parents to pass this on when they find out where you are. By that time, I'll probably be in Hong Kong. Rick has bought Debbie some food. She doesn't want any, but he warns they could be there for a while. Debbie thanks Rick for his help with the police. It's clear she didn't know what Darren had been plotting. She asks Rick how he worked it out, but he tells her it was just some fancy guesswork. DEBBIE: Why didn't you tell me? RICK: Would you have believed me? Debbie asks how Michael got mixed up in it, and Rick admits to telling him. Michael freaked out, knowing what bad news Darren was, and he broke out to help her. (Er yeah, Deb, how do you think he got to the petrol station? Day release?!) 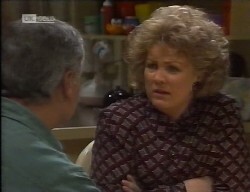 Debbie is upset - she realises that Michael's going to be in even more trouble for breaking out. Phil and Julie rush around the corridor and Debbie jumps up to hug Phil. DEBBIE: Dad, Michael's been shot! PHIL: I know; where is he? DEBBIE: In there, with the doctor. Phil and Julie both move to go into the room, but Rick tells them they're not allowed in - he and Debbie had been told to wait. Julie quizzes them about how they were involved in it - after all, a detention centre is the last place she'd expect to find a gun! RICK: We weren't at a detention centre. We were at a petrol station. There was a robbery. JULIE: (sadly) I should've known he couldn't keep his nose out of trouble. 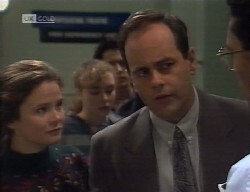 Debbie insists it wasn't Michael's fault, but the doctor interrupts them. DR PALMERSTON: The bullet's still in there. We're going to operate. JULIE: He'll be all right? DR PALMERSTON: It's pierced a lung. Michael's lost a lot of blood and there's some respiratory distress. PHIL: (sternly) But he'll be all right? DR PALMERSTON: We'll be doing everything we can. Excuse me. He goes back into the room. Phil, Julie, Debbie and Rick all look shocked. Julie puts a hand on Phil's shoulder. The house is in darkness. Doug enters and he hears some noises from down by the bedrooms. DOUG: All right. Come out of there. A figure puts the light on - it's Brad! DOUG: Brad?! What are you doing here?! Doug is pleased, and tells him that Lauren has been trying to contact him. Brad reveals that he went to Singapore - and he's brought back someone he hooked up with there. Brad yells to the bedrooms, telling the girl to come out. Connor has arrived to pick Lauren up. He's surprised that there are no suitcases. Lauren tells him she hasn't packed yet - she's been too busy writing a letter to Brad. Lauren admits she's upset to not say it face to face to Brad, but Connor is stoked by her decision to go with him and tells her that she won't regret her decision. They hug. Phil, Rick and Debbie are all sitting down. Julie is pacing. JULIE: And to think I was taken in by that boy's smarm. I should've known any friend of Michael's would be trouble. DEBBIE: Mum! Haven't you been listening? He wasn't Michael's friend - he was just pretending! Julie says that Debbie should've known better. Rick defends Debbie, saying that she didn't know she was going to be part of a hold-up - she thought they were just going to steal some chocolate. JULIE: Oh! Oh, that makes it all right, does it?! Julie changes tack and says she should thank her lucky stars they're not going throw the book at Debbie. Phil is more worried about Michael, and hopes they won't throw it at him for breaking out of the detention centre. He tells Rick that he should've come to him if he knew Darren was trouble. RICK: I tried! I tried to tell you! He turns to Julie and says that he tried to tell her too, but Phil and Julie were too busy yelling at each other to listen. Julie suggests that Debbie and Rick go for a walk, as Michael will be in surgery for a while, and asks them to phone Nicholas' mum because Hannah will still be there, waiting to be picked up. They leave. Julie turns to Phil. JULIE: You look a bit pale. Would you like a glass of water? PHIL: Rick's right. If we weren't so wrapped in our problems, none of this would've happened. Debbie wouldn't have got mixed up with Darren. My son wouldn't be in there. JULIE: Oh, darling, please don't. Michael will be all right, I'm sure of it. She comforts him by putting her arm around him, but after a while he pulls away. He walks up the corridor, leaving Julie standing alone. Lucy is telling Doug a story about a photo shoot, where a monkey ran off with her sari and she was left with a bunch of wolf-whistling American marines gawking at her in her swimsuit. Brad saved the day by getting her wrap back off the monkey and he chased off the marines! Lucy comments on the coincidence - another half an hour, and they'd have missed each other. Doug says that Brad wouldn't have left Singapore without looking Lucy up. Lucy says she's not always at home - so they might not have run into each other if he had called over. She says the photography/model stuff is all a bit hectic, so that's partly why she's returned to Australia - for a bit of time out. Helen's birthday has coincided with it nicely - and Lucy asks if she can stay at Number 28 so she'll remain a surprise. Doug tells her about the party and says that Pam will be tickled pink - Lucy will be the icing on the cake! Lucy goes for a shower and Doug gives Brad some home truths - Lauren is not going to be happy to find out that he's landed back in Erinsborough with his ex-girlfriend in tow! Brad reckons that Lauren will "be cool". Doug tells him to get across the street and get explaining before Lauren and Lucy meet. Brad reckons there's no hurry - he sent Lauren a message, so she knows what the situation is. Lauren and Connor are hurriedly packing. She's not impressed at his attempts to throw out her favourite dress, but he offers to buy her a dozen when they get to Hong Kong! He shuts the suitcase and tells her to write a note to Lou. There's a knock at the door and Connor thinks it will be the taxi. In fact, it's a bouquet of flowers - there was a mix up at the florists and she was supposed to receive them earlier in the day. The note says they're from Brad. She gives it to Connor. He reads it aloud. CONNOR: On my way home. Doing some serious thinking about us. Now I know what I really want. Rick and Debbie return to the corridor. Debbie turns frantic because Phil and Julie aren't there. Rick suggests that they've gone for a coffee, but Debbie doesn't buy it - they just walked past the canteen themselves. Debbie is very upset and starts ranting that something could've happened to Michael and it'll be all her fault. Julie emerges from another corridor and wants to know what's wrong. She explains that Michael's just been brought back from theatre and Phil's with him. It's still too soon for them to say if he's going to be ok and Debbie is desperate to see him. Julie tells her that Phil's the only person allowed to be with him, and he's asked Julie to take her home. Debbie tries to push past to see him, but Julie talks her around - Michael's still asleep. She says they'll come back tomorrow. DEBBIE: What if he dies during the night? Rick joins in with Julie and manages to convince Debbie to go home. He offers to stay at the hospital so that if there are any changes, he can call her straight away. Julie and Debbie leave. Lou is looking for a trace of Lauren, but he can't find her. 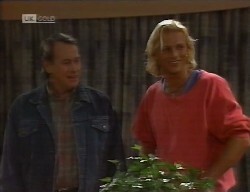 Cheryl suggests that she left him the flowers instead of a note, but Lou's sure they're not for him. Cheryl wishes that she could be whisked out of the country - it'd serve Darren right. LOU: Hey. Come on. It's not that bad. CHERYL: Oh, Lou! You've heard what he's been charged with - attempted armed robbery. And all of those other offences for carrying a knife. He won't get off this in a hurry! LOU: We'll get him a good lawyer. CHERYL: No, I won't! No, I won't, not this time! I said to him, you go off the rails one more time, you're on your own! For all of her words, Cheryl's clearly very upset. She wonders if she's to blame. Lou interrupts, telling her that she did her best and that's all anyone can ever do for their kids. He tells her that they'll get through it. Debbie and Julie have got some takeaway. 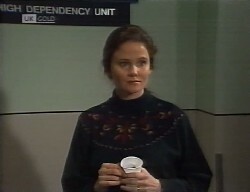 Julie hopes that the hospital staff will offer Phil something to eat, as he'll need something if he decides to sit next to Michael's bed all night. Julie is utterly bemused by the efforts that Darren took to worm his way into her good books and to charm Debbie. JULIE: Whatever could Michael have done to make him want revenge so badly? DEBBIE: He didn't do anything, Mum. Darren's had it in for him from the start. JULIE: There's no smoke without fire. Especially where Michael's concerned. 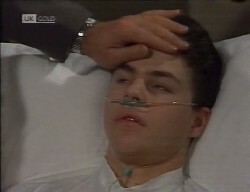 Debbie flips and tells Julie that if Michael hadn't turned up when he did, she could be the one lying in the hospital having been shot. JULIE: Thay may be true, but heroic antics don't excuse the past! DEBBIE: You want him to die, don't you? You're glad this happened. DEBBIE: You know how much it'll upset Dad if anything happens to Michael. Talk about Darren wanting revenge - you're a hundred times worse! Debbie storms off, leaving Julie completely flabbergasted! Michael is asleep. Phil is stroking Michael's forehead. Michael opens his eyes, and Phil smiles at him. MICHAEL: I've done it again, haven't I? MICHAEL: Deb. And Darren. I knew there'd be big trouble. PHIL: Whatever you did, you did it for the right reasons. As far as I'm concerned, that makes it ok.
Michael closes his eyes and Phil carries on stroking his forehead. Lauren is sitting in the Coffee Shop with her suitcases. Doug walks in and wonders if she's running away from home! He's looking for Pam because she's supposed to have gone there straight from work. She's not about, so he sits and waits. He tells Lauren that he has a surprise for her. Lauren tells him she has one of her own - she got flowers and a note from Brad...apparently he's on his way home. Doug tells her that *is* his surprise - Brad's at Number 28! Lauren can't understand why Brad's not been to see her - she's been trying to contact him for days. It's just after 8.30pm so Lauren decides to take the risk and goes to see Brad. She reckons she can still catch her plane, as it doesn't leave until 10pm. LAUREN: The flight to Hong Kong. Doug is confused! He tries to warn Lauren to not go rushing around there without letting Brad know first, but it falls on deaf ears. Lucy shows Brad a dress, but he's dismissive - he can't find his shoes! Lucy worries that her dress is too showy for the party. Brad tells her that she looks sensational and Lucy is pleased - that's what she wants to do...cause a sensation in Ramsay Street! The zip on her dress sticks and Brad starts to help her out of it. Just as he does so, Lauren bursts in through the door - and they all look surprised.